Asia, whereas the larger, more derived horned dinosaurs all hail from western North America. Yinlong ("hidden dragon") is a basal ceratopsian from the Late Jurassic Epoch of China. It was small and primarily bipedal, measuring only 4 feet (1.2 m) long. It is currently the oldest known member of the ceratopsians. Its skull features a bony ridged cap also seen in early pachycephalosaurs as well as a small but well-defined frill that is characteristic of horned dinosaurs. Psittacosauridae consists of only one undisputed taxon, Psit-tacosaurus ("parrot lizard"), which is represented by at least 10 named species—probably not all of which are valid—and multiple specimens of complete skeletons of individuals in various stages of growth. Protoceratops ("first horned face"), an equally important early neoceratopsian, was a small quadruped with a short frill. Both of these dinosaurs were discovered in 1923, during an expedition to Mongolia by a team from the American Museum of Natural History. Until recently, scientific understanding of the most primitive ceratopsians barely extended beyond what is known of Psittaco-saurus and Protoceratops. With the exception of a few intermittent finds, research on basal ceratopsians progressed at a slow pace between 1923 and the 1990s and the start of new explorations in China. Since that time, paleontologists working on the earliest horned dinosaurs have been uncovering remarkable new specimens from Early Cretaceous deposits, some of which have also yielded feathered dinosaurs, filling in gaps and introducing new puzzles to the story of ceratopsian evolution. The origin of ceratopsians appears to be firmly rooted in Asia. Ceratopsians represent a monophyletic group with a single common ancestor. Psittacosaurus is widely regarded as one of the most primitive ceratopsians, but was probably a sister group to the Neoceratop-sia rather than their common ancestor. The biggest psittacosaurs were only about 6.5 feet (2 meters) long, including the tail. They weighed about as much as a German shepherd. The psittacosaur skull is notable for its parrotlike beak. The small skull had a boxy shape when viewed from the side and was composed mainly of thin, delicate bones with large openings for the eye and behind the eye. This beak was a forerunner of that seen in neoceratopsians. The cheek area of the skull was reinforced by thickened bony points that would be retained in all later certatopsians. Psittacosaur teeth were positioned in the cheek area like those of other ceratopsians but were more widely spaced and had rounded, ridged tops for cutting and grinding vegetation. In contrast, the horned giants such as Triceratops developed complex batteries of teeth whose function was primarily for shredding tough plant material rather than chewing or grinding it. In psittacosaurs, the characteristic frill of the ceratopsians was only slightly developed; it took the form of a bony ridge around the back of the head that hinted at the large neck frill seen in neo-ceratopsians. The skull was short and tall, with a high palate in the mouth and the distance from the eye to the front of the skull was proportionately shorter than in any other known dinosaur taxa, giving Psittacosaurus a truly parrotlike appearance. 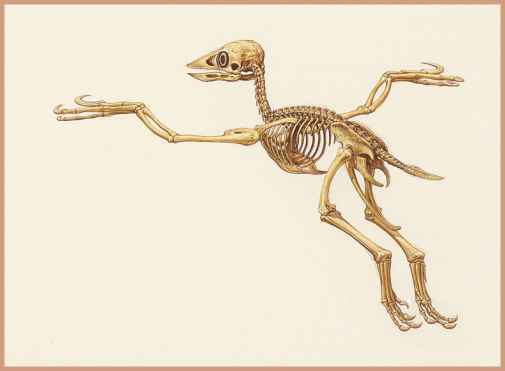 Psittacosaurs had five fingers on their hands, although two of these were smaller and weaker. Discoveries of psittacosaurs have accelerated in recent years. A contentious new genus, Hongshanosaurus (Early Cretaceous, China), was proposed in 2005 by Chinese paleontologist Hailu You based on two fossil skulls, one a juvenile. 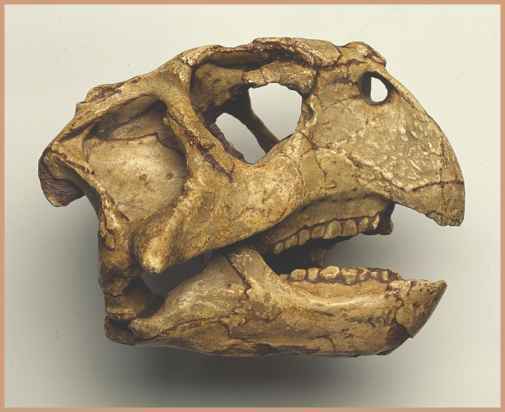 This taxon is reported to have a shorter skull than Psittacosaurus as well as an elliptically shaped eye socket. Remarkably, six new species of psittacosaurs have been described since 1997.
later, and it appears to be a common ancestor to them both. This places Chaoyangsaurus within the Neoceratopsia and not with the psittacosaurs. It was once thought that psittacosaurs were the ancestors of all other horned dinosaurs. The presence of Chaoyangsaurus instead suggests that psittacosaurs were a side branch of the Ceratopsia evolutionary tree rather than the direct ancestors of neoceratopsians. Going back even further in time, the deeper roots of all Ceratopsia probably lie with animals such as Yinlong from the Late Jurassic of western China, and perhaps even with the Early Jurassic heterodon-tosaurids. Chaoyangsaurus is currently accepted as the most basal Neoceratopsia. Protoceratopsids were a basal group of the Neoceratopsia, a clade of small, frilled dinosaurs found in Late Cretaceous deposits of China, Mongolia, and North America. The best-known taxa include Protoceratops (Late Cretaceous, Mongolia and China) and Bagacera-tops (Late Cretaceous, Mongolia). Protoceratopsids were small—the largest specimens only measured about 6 feet (1.8 m) long from the beak to the tail. The skulls of Protoceratops and its close relatives were also at the small end of the ceratopsian scale, at a maximum of about 22 inches (55 cm) long. The neck frill was pronounced, but short. Protoceratopsids had stubby claws on their hands and feet and walked primarily on four legs, although they probably could have risen up on two legs if necessary. They had eight fused sacral vertebrae over the hip—an intermediate step from the customary four or five fused vertebrae found in other dinosaurs and the 10 found in the larger, more derived ceratopsians. The beak of Protoceratops was strong and sharp for snipping vegetation. It had teeth in the front of its mouth as well as teeth well inside the mouth, lining the interior of the cheek area. Proto-ceratopsids may have had large heads because they needed powerful jaws and jaw muscles to chomp the coarse vegetation on which they fed. The tops, or crowns, of the teeth were leaf-shaped with ridges for cutting and slicing plants. Dinosaurs, like other reptiles, always had a new tooth to replace a tooth that was lost. Since Protoceratops only had a single replacement tooth resting beneath each exposed tooth, it seems that this dinosaur did not lose its teeth very often. So many specimens of Protoceratops have been discovered that the entire growth cycle of this dinosaur can be studied, from hatch-ling to adult. The frill developed early in the life of these dinosaurs. The frill had two large holes in it; these holes presumably were covered by skin. By the time Protoceratops was about half adult size, the frill took on either a high and wide shape or a low and narrow shape. The difference in shape may have corresponded to which individuals were males and which were females. In addition to the frill, as Protoceratops got older, it developed a bony ridge along the center of its skull, beginning at the nose. This ridge may have been used in butting contests between competing males. The transition from protoceratopsids to the large-frilled centro-saurines and chasmosaurines is represented by several basal neo-ceratopsians. Montanocertatops and Leptoceratops, from the Late Cretaceous of Montana and Alberta, represent an important North American transitional phase. This small clade included anatomical features shared with later horned dinosaurs but not with protocera-topsids. These features included a rounded nasal opening, a more elongated shape to the beak and additional changes to the shape of the skull, and more robust feet and digits. Archaeoceratops (Early Cretaceous, China) was named in 1996 by Dong Zhiming (b. 1937) and represents a small, bipedal cera-topsian that had a small frill, no horn, and measured just 3.33 feet (1 m) long. Yamaceratops (Early Cretaceous, Mongolia), described by Peter Makovicky and Mark Norell in 2006, is possibly the most basal taxon to display a number of derived traits traditionally associated with the skulls of classic neoceratopsians. Makovicky and Norell believe that Yamaceratops represents an evolutionary stage within the Neoceratopsia between the psittacosaur Liaoceratops and Archaeoceratops. There is a remarkable fossil specimen known as the "fighting dinosaurs" that opens a window onto the world of Protoceratops. Discovered in Mongolia in 1972, this spectacular find revealed an adult Protoceratops locked in mortal combat with the predatory dinosaur Velociraptor. The two desert-dwelling dinosaurs were joined in battle at the time of their demise, having been buried alive suddenly by a violent sandstorm or collapsing dune, entangling them forever. 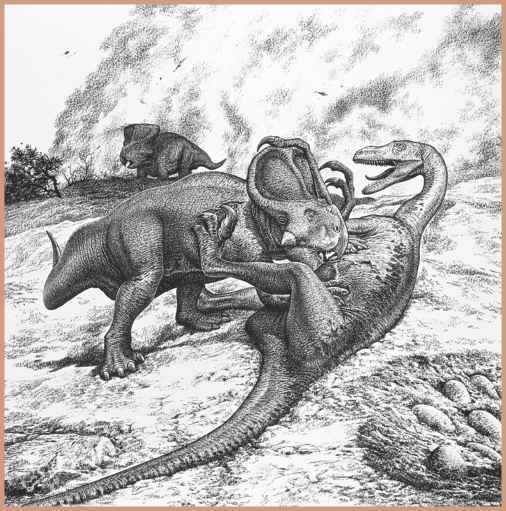 The specimen death pose shows the left arm of the predator firmly clenched in the jaws of the struggling Protoceratops. The value of this specimen is immeasurable. Not only does it confirm the predator-to-prey relationship between these two animals, but it also offers a glimpse at the kind of life-and-death struggles that probably took place every day in the wide expanses of Cretaceous Asia.